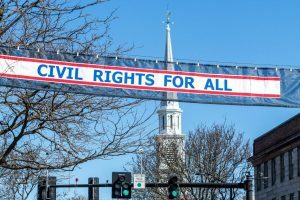 On the morning of Sunday April 8th at 8 am to 9 am the Brattleboro fire department will hang the We Celebrate Democracy/Civil Rights For All main street banner over Main St. at High St. in downtown Brattleboro. I’m going down to watch! It makes me feel good to look up and see those words “Civil Rights For All” on the banner up above Main Street, so I go down to watch the fire company put the banner up. I feel like being there is a way I can make a public statement that Democracy and Civil Rights For All people are very important to me. The Works will be open. In order to stand up to the bullies in our society, we say at all our events: All people who attend this event agree to be nonviolent in word and in deed. We are Woody Bernhard and Susan Kunhardt from Marlboro. We were inspired by Donald Trump’s inauguration. We raised funds to have the banner made by Ann Brush of Starksboro Vt , and to fly the banner over Main Street in Brattleboro on the weeks of April 23rd, June 25, September 3rd and October 8th. in 2017, and Martin Luther King Day week, 2018. Forty people carried the banner in the Brattleboro 4th of July parade and sang songs praising Democracy. We made post cards of the banner with supporters in front of local post offices and businesses. We handed out 500 Brattleboro post office postcards to spectators at the parade. The post office postcards are free at the Marlboro and Brattleboro town offices and at Brooks Memorial Library. We held Democracy Forums at the River Garden Brown Bag Lunches on Wednesdays from June to January. We plan to do what we did last year again this year. We are dedicated to positive nonviolent public action for Democracy and Civil Rights For All People. We Celebrate Democracy/Civil Rights For All is funded by small local donations.